Happy Monday friends it's been a pretty nice Winter so far but we have not been getting much rain. So now I must water by hand which can be a little work but fun. That way I visit every plant to see how they are doing. This is Tallulah relaxing in the garden on a January late afternoon just as the sunset begins to set on the hill behind our home. 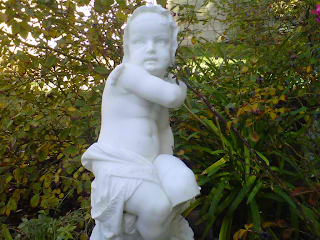 The painted whites on the cast iron and cement statuary seem to work well with the different shades of green in the garden. 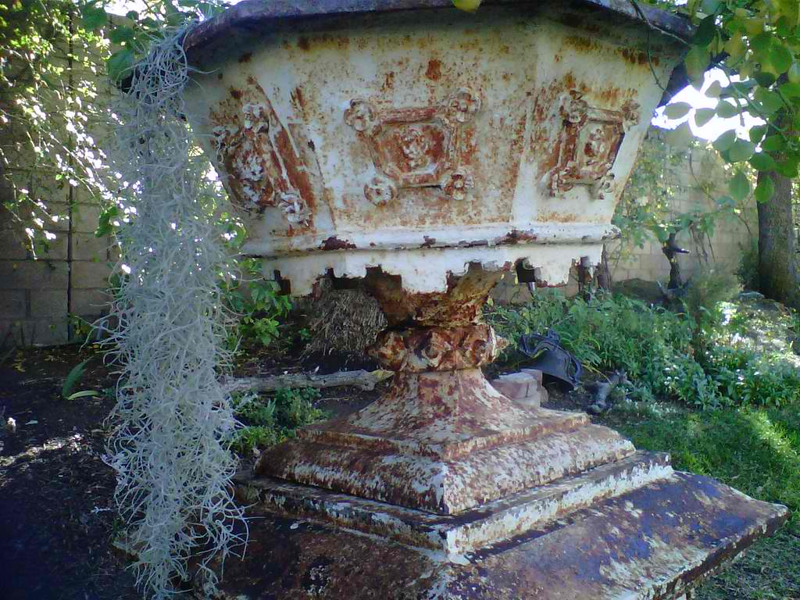 This urn below has some Spanish moss that has survived the cold weather so far. I guess it is safe from the frost since the branches of the trees shield it from the frost. I love your whites, they do bring a sense of calm to a garden I think. We are having a mild winter here in SW England so far. I spent yesterday in the garden pruning the Clematis and dreaming of spring. The first snowdrops are coming up, what a delight. 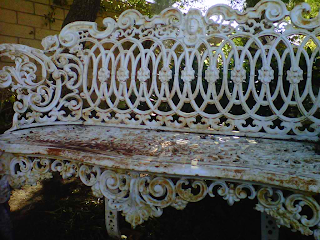 I love your vintage garden items, that bench is to die for! 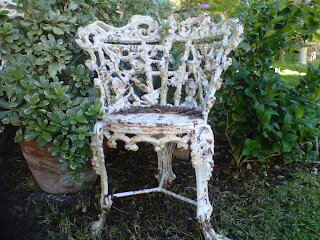 Your iron garden furniture is the things that dreams are made of. i once had some, but sold it for a down payment on a house I wanted to buy. Oh well, I love yours. Richard from My Old Historic House. Looks like those blooms will be here before they are supposed to be. My gardens are acting like it's spring already. Your baby there is so pretty. We have been getting rain and expect some more - the rain that hit Texas and is in Alabama now. I laughed when I stepped out with the dogs to get mail this morning - it is warmer outdoors than in our house - this old house love to hold in the cold! Love your garden seating and urns as well as the statues - I love them white - it makes the garden seem ethereal to me! Tallulah is precious! Thanks so much for sharing with A Return to Loveliness! 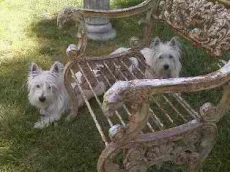 Your westies are so sweet. Mine adds a bright spot to our yard, home, and heart! 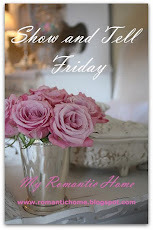 Hmmm, I'm reading your blog as I watch a snow storm out my office window. I want warm...:-( Beautiful pictures as always. 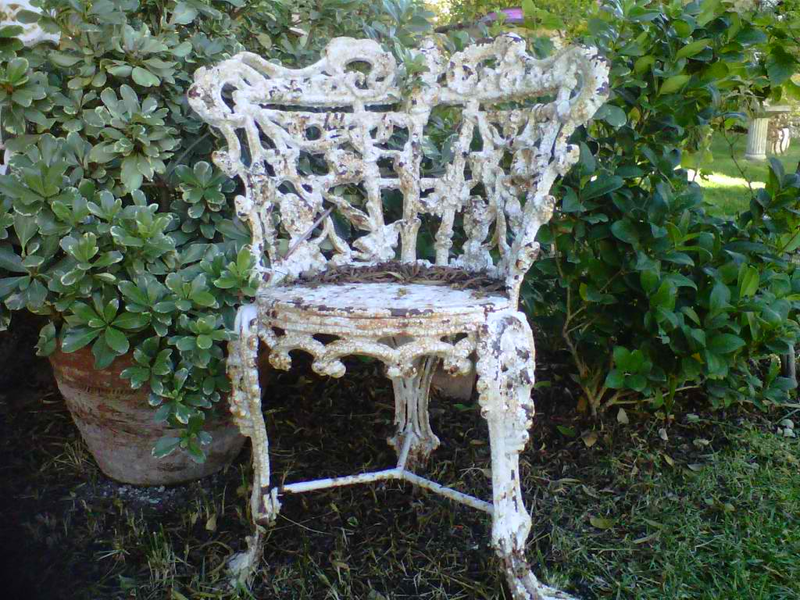 I love your white iron garden furniture! 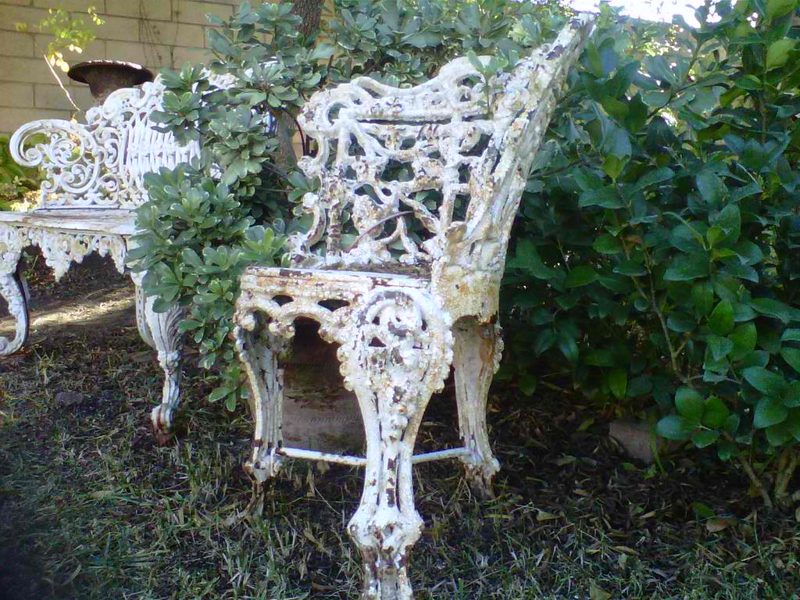 Your garden is so romantic with all the iron furniture and statues. 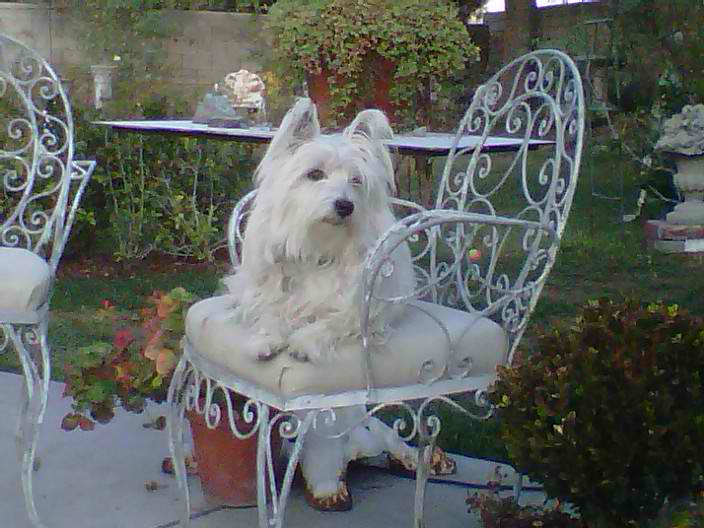 I love the picture of Tallulah; she is so sweet. 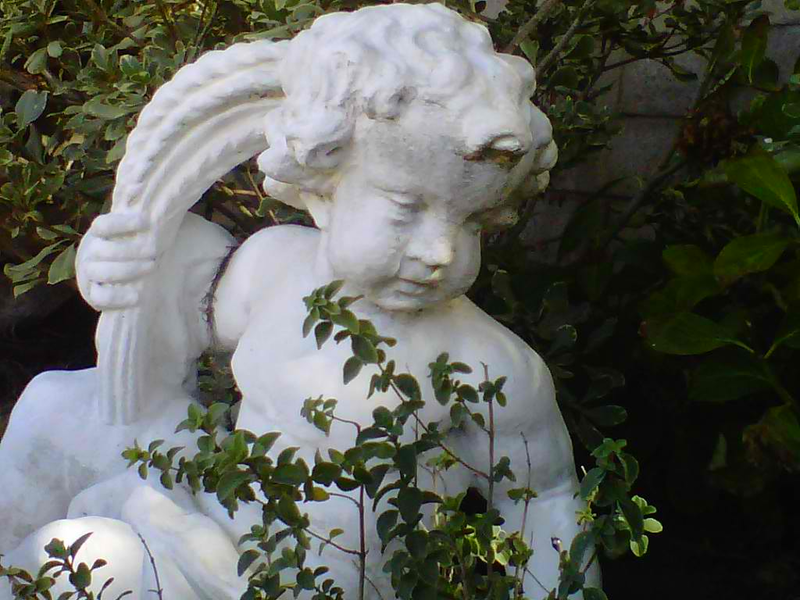 wow...wow..wonderful pieces in your garden & cute puppies! 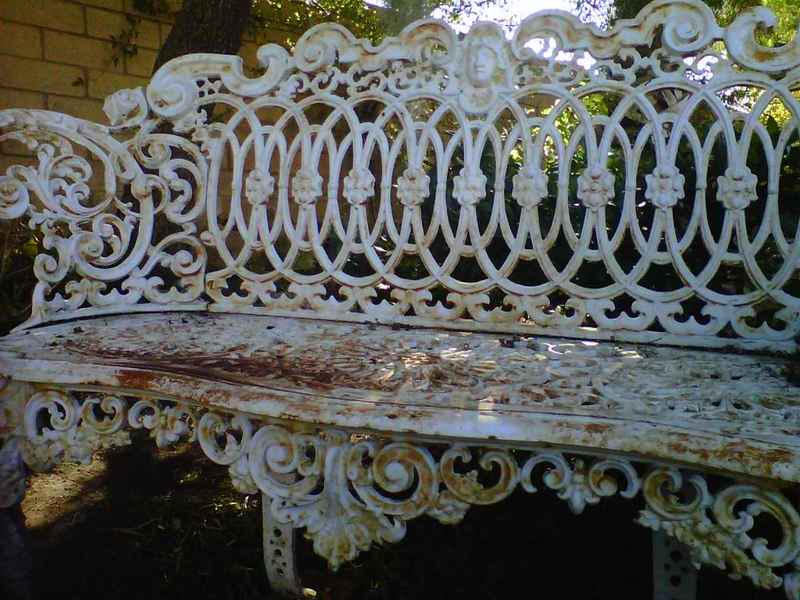 I so miss all my wonderful iron furniture. I am glad you have yours and are sharing it with all of us. Have a great day. Richard from My Old Historic House. 40 something, who cherishes family and friends. And commited to my relationship. Also the luv of God which is a caring and forgiving one who loves all his children no matter what they do. I luv Jesus and adore and respect the Virgin Mary. We are ex-dealers, in the Antique business. But with the poor economy in California, and with both of us working full time jobs we have taken a vacation from the business. Until Raymond retires in two years. 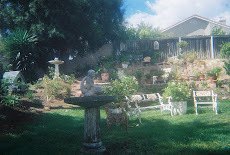 I really have a passion for Gardening and watching nature play in our garden. And also hunting for antiques and adding those little treasures to our collections.